The Concourse: Imagine being alive in 1969 and going to see The Wild Bunch when it was new. It was released in an era when American movies were changing, and when audiences were getting more and more used to seeing gruesome violence onscreen, like in Bonnie & Clyde. Granted, it was still a time when movies would tell us that a character was shot to death by showing us that character grabbing his chest and keeling over. Those audiences barely ever saw a rivulet of fake blood. The Wild Bunch, however, was the beginning of something entirely different. It has shotgun bursts that send tremors through bodies, with blood-spatters and meat-chunks flying. Shootouts break out in crowded towns, where neither cops nor criminals are especially concerned whether innocent women are caught in the crossfire. (We never see any actual kids dying in the movie, but we always see them standing around when the shooting starts, so it seems likely that plenty of them didn’t make it to the end of the day, either.) The final shootout lasts maybe 10 minutes, and to 1969 audiences, it must’ve felt like Scarface multiplied by Hard-Boiled to the power of the Normandy Beach scene from Saving Private Ryan. Rolling Stone: Despite the controversy, The Wild Bunch isn't about violence, it's about character. Pike Bishop, played by William Holden in a career-best performance, leads his battered bunch of aging outlaws out for one last score in Texas before fleeing to Mexico. The time is 1913, and the shrinking frontier is closing in on Pike and a group that includes Pike's right hand, Dutch (Ernest Borgnine), old man Sykes (Edmond O'Brien), the whore-running Gorch brothers – Lyle (Warren Oates) and Tector (Ben Johnson) – and their ally Angel (Jaime Sanchez), whose girl has dumped him for General Ma-pache (an unforgettably vile Emilio Fernandez). They're all killers, but the bunch has a code expressed by Pike: "When you side with a man, you stay with him, and if you can't do that, you're like some animal, you're finished." Peckinpah tracks the subtle factors that unite this dying breed. Much of the restored footage consists not of action but of dialogue scenes that pull us into the heads of these gunfighters as they discuss their past and the squeeze being put on their future in an era of motor cars and sophisticated weaponry. 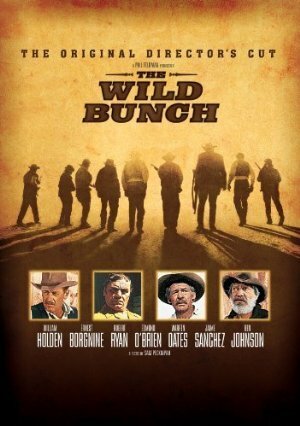 NYTimes: The Wild Bunch takes the basic elements of the Western movie myth, which once defined a simple, morally comprehensible world, and by bending them turns them into symbols of futility and aimless corruption. The screenplay, by Peckinpah and Walon Green, follows the members of the Wild Bunch from their disastrous, profitless experience at San Rafael to Mexico, where they become involved with a smilingly sadistic Mexican general fighting Villa. Although the movie's conventional and poetic action sequences are extraordinarily good and its landscapes beautifully photographed (lots of dark foregrounds and brilliant backgrounds) by Lucien Ballard, who did Nevada Smith, it is most interesting in its almost jolly account of chaos, corruption, and defeat. All personal relationships in the movie seem somehow perverted in odd mixtures of noble sentimentality, greed, and lust. Never satisfactorily resolved is the conflict between William Holden, as the aging leader of the Wild Bunch, and Robert Ryan, as his former friend who, with disdain, leads the bounty hunters in pursuit of the gang. An awkward flashback shows the two men, looking like characters out of a silent movie, caught in an ambush in a bordello from which only Holden escapes. The ideals of masculine comradeship are exaggerated and transformed into neuroses. The fraternal bonds of two brothers, members of the Wild Bunch, are so excessive they prefer having their whores in tandem. A feeling of genuine compassion prompts the climactic massacre that some members of the film trade are calling, not without reason, "the blood ballet." Peckinpah also has a way of employing Hollywood life to dramatize his legend. After years of giving bored performances in boring movies, Holden comes back gallantly in The Wild Bunch. He looks older and tired, but he has style, both as a man and as a movie character who persists in doing what he's always done, not because he really wants the money but because there's simply nothing else to do. Empire: Peckinpah sought to breathe fresh life into the outlaw myth by focusing on Bishop's moral bankruptcy and redemption (an antidote to Butch Cassidy's idealised, comic take). But just as that film is now best remembered for a song and a bike ride, The Wild Bunch has gained immortality through the two enormous gun battles which bookend the drama. The opening fight, when the gang ride into the town of Starbuck to rob the railroad offices where a posse of bounty-hunting gunmen await, is notable for the utterly indiscriminate carnage which follows. A Temperance Union group (surely no coincidence given Peckinpah's lifelong love of the bottle) march into the line of fire and innocent men and women are graphically gunned down along with the outlaws. Goaded later by a journalist at a press conference as to why he hadn't shown any children being torn apart, Peckinpah replied, "Because I'm constitutionally unable to show a child in jeopardy." What Peckinpah could show, however, was a group of children laughing as they watched a scorpion being eaten alive by ants before setting them on fire, suggesting that violence is our innate original sin. (Look in vain for the "No animals were harmed..." disclaimer). Even this unsettling opening, however, was eclipsed by the firepower of the film's climactic shoot-out in Agua Verde, filmed in a disused winery near the Mexican town of Parras, an apt setting for such an inundation of claret. Having initially allowed one of their gang, Angel, to be captured and tortured by local warlord Mapache, the gang belatedly decide to rescue and the four walk into the tyrant's stronghold. What ensues is unprecedented cinematic slaughter, the most visceral display of carnage ever committed to film. The promotional material for The Wild Bunch boasted that it used more bullets than the real Mexican revolution. Slightly tasteless, but it had a point. An estimated 90,000 rounds of blank ammunition were employed, and when the first day of shooting wrapped the company had run out of both ammo and fake blood. During the course of the shoot, Peckinpah sacked 22 crew members, pour encourager les autres. He raged that the squibs (small explosive charges filled with fake blood to simulate a gunshot) were not sufficiently realistic and demonstrated what he wanted with live gunshots. The props department responded by filling the squibs with more of the red stuff and raw meat. Satisfied, Peckinpah insisted that actors wore them front and back to mark the entry and egress of every bullet. Although the film was cut behind Peckinpah's back, its set-pieces (marshalled by the director, but edited by Lou Lombardo and making extensive use of slo-mo) became the template for three decades of action. Senses of Cinema: Although its violent reputation may seem anachronistic by today’s standards and possibly surpassed by “rednecked peckerwood” imitators such as Quentin Tarantino, The Wild Bunch still remains unsurpassed as one of the great Westerns of the last century. Following Peckinpah’s ideological assault upon the conventions of John Ford’s cavalry trilogy in the mutilated, but still resonant, Major Dundee (1965), The Wild Bunch continues his brutal interrogation into the pathological nature of American masculinity and society – making his film more relevant now than ever. Jim Kitses sees the film as a dark vision of the American experience, succinctly expressed in his monumental sentence, “The Wild Bunch is America”. Others have noted its allegorical associations concerning the Vietnam War. But The Wild Bunch uniquely revealed the redundancy of nostalgic myths of the Frontier as well as unveiling the dark side of those American imperialist ambitions also documented by Gore Vidal in his historical novel Empire (1987). Peckinpah continues his ironic demolition of Ford’s West by again using his mentor’s favourite hymn, “Shall We Gather at the River”, before the first massacre in The Wild Bunch, as well as casting Ford icon Ben Johnson in a darker version of his Ford roles. Peckinpah knows his traditions. But there is no “anxiety of influence” operating here. Instead, Peckinpah depicts his own era’s age of anxiety by revealing the bankruptcy of certain ideological formulas that influenced his predecessors. In Vera Cruz (1954), Robert Aldrich anticipated Peckinpah by depicting American mercenaries in Mexico but not in the same apocalyptic and political manner. Stylistically, Akira Kurosawa’s The Seven Samurai (1954) and Arthur Penn’s The Left-Handed Gun (1958) influenced Peckinpah. But he extended those influences in more creative and dynamic ways. The Guardian: Offered the screenplay for The Wild Bunch, [Peckinpah] tore it apart with a vengeance, retrofitting it to accommodate his own key concerns and themes: men out of time facing obsolescence and death (it could easily be called No Country for Old Men); violence as a ballet of brutality; and corruption as all-encompassing, with every transaction, be it moral, monetary or sexual, deeply stained by betrayal. By the time The Wild Bunch hit screens and became the most controversial movie of 1969, Peckinpah's erstwhile detractors were elevating him to the pantheon, up there with Stanley Kubrick and John Ford. He also revolutionised film editing, shooting his many, violent action set-pieces with multiple cameras and viewpoints, running the cameras at different speeds, from 60 to 120 frames a second, after seeing what editor Lou Lombardo had achieved with similar effects on earlier projects. The results were eye-opening, stretching and collapsing time in each of the movie's many masterfully assembled action set-pieces, particularly the opening robbery. That sequence included the famous credit, "Directed by Sam Peckinpah" hammered on to the screen after Pike Bishop (William Holden) spits out the words: "If they move, kill 'em!" Which immediately told us where the director's sympathies lay – with the doomed and the outcast. Roger Ebert: The movie is, first of all, about old and worn men. Holden and his fellow actors (Ernest Borgnine, Warren Oates, Edmond O'Brien, Ben Johnson and the wonderful Robert Ryan) look lined and bone-tired. They have been making a living by crime for many years, and although Ryan is now hired by the law, it is only under threat that he will return to jail if he doesn't capture the bunch. The men provided to him by a railroad mogul are shifty and unreliable; they don't understand the code of the bunch.